Dangerously Cool: Introducing The New iPod Ninja - iPhone.MY - Daily News On Mac, iPhone, iPads, iPods and more! 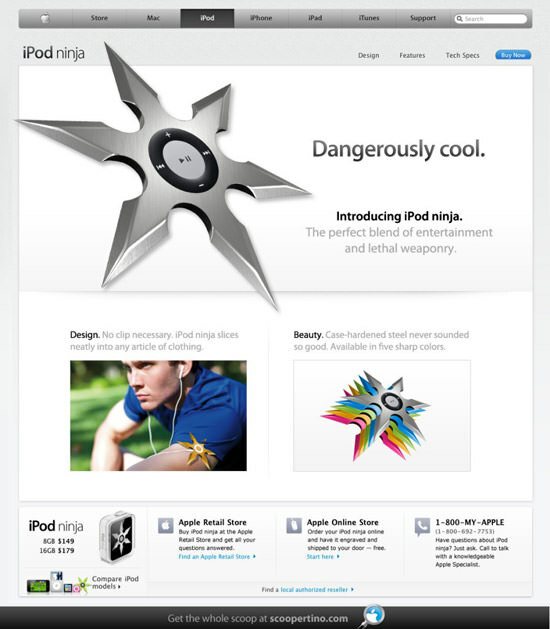 Today Apple announced the “dangerously cool” iPod ninja, the last of the new 2010 iPod family. This razor-thin iPod combines the fun of entertainment with the thrill of lethal weaponry. And it’s super-easy to buy. All you have to do is show a photo ID, fill out a form, then wait three days for approval by the National Criminal Background Check system. iPod ninja fits into that sweet spot between the iPod touch and a small handgun,” says Apple spokesperson Ted Wetmore. “It gives you peace of mind. You can either enjoy your music on the device — or you can fling it at anyone who looks at you funny. With a little practice, you can take down a foe at 50 feet. However, there is a dark side to the new iPod. As iPod ninja sales boom, some blogs are already reporting a “death grip” problem even worse than the one that plagued iPhone 4. 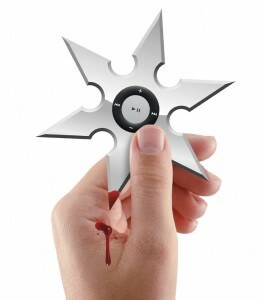 If you hold iPod ninja in a certain way, you may require immediate medical care. 2 Million Apple TVs Sold So Far?